On February 8, 2019, at approximately 10:15 p.m., M-LFD Companies 3, 5 and the Ambulance Unit were dispatched to the intersection of Northern Boulevard and South Middle Neck Road for an overturned auto. A8767 was the first unit to respond, and arrive on scene and confirmed a vehicle on its side, with all of the occupants self extricated. One aided was transported to an area hospital for evaluation. 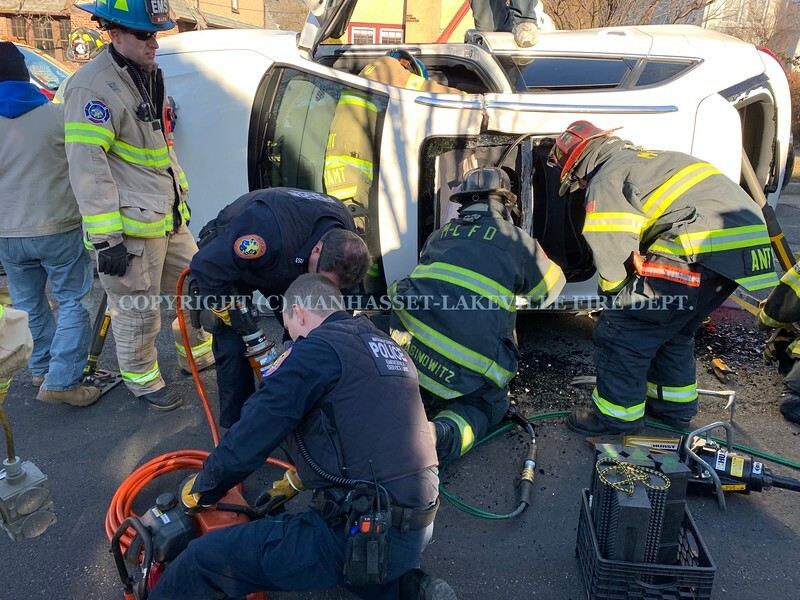 On February 9, 2019, at approximately 3:07 p.m., M-LFD Companies 3, 4, 5 and the Ambulance Unit were dispatchced to the intersection of Walden Avenue and Concord Avenue for an overturned auto with entrapment. A8767 was the first unit to respond, and arrive on scene and confirmed a vehicle on its side with an occupant still trapped in the car. Members of M-LFD Companies 3, 4 and 5 along with the Nassau County Police Department’s Emergency Service Unit operated extrication equipment to free the occupant, who was transported to an area trauma center. Click here to see the rest of the images from Manhasset Lakeville Fire Department’s gallery, February 2019 Overturns.